The history of home care goes back well over a century, originating in the 1880s. In a time when life expectancy was short and disease was rampant, nurses provided care for most ill individuals, as well as expecting mothers and newborns, in the home. Since then, as medicine and family dynamics have evolved and residential and hospice care have risen in popularity, home care services have also changed. Who is Receiving Home Care? Of the approximately 8.4 million Americans receiving long term care, over 4.7 million receive home care with the rest divided between nursing homes, hospice, residential care, and adult day care services. While home care services are available to individuals of any age in need of assistance with activities of daily living (ADL) and instrumental activities of daily living (IADL), including the disabled and individuals recovering from surgery or hospitalization, approximately 80% are seniors aged 65 years or more. For seniors requiring ADL support, over 95% of home care recipients require assistance with bathing, 84% require assistance dressing, and about 65% require continence and toileting support. Over half (51.2%) of home care recipients require assistance with feeding. The majority of seniors receiving any type of long term care are women, with 62.7% of women aged 65 years or more receiving home care. The prevalence of Alzheimer’s Disease and other dementias among home health care recipients is about 30%, while nearly 35% of care recipients suffer from diagnosed depression. 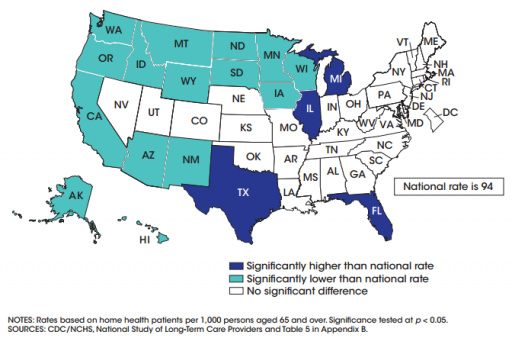 While the national average of patients aged 65 years or more receiving home care hovers at 94 per 1000 seniors, the ratio of seniors requiring home care in Illinois is significantly higher – see the map below! 66% of caregivers are female and provide care to a relative. The typical caregiver is a 46 year old woman who provides at least 20 hours of care weekly for a parent. While the number of elderly individuals receiving some type of long term care was 8.4 million, the number of seniors who require it is closer to 12 million, annually. As of 2012, the older population (65+) has increased by 21% in just ten years, and the number of adults reaching the milestone age continues to rise. This is good news for those of us who wish to a live a long life, but troubling for our family members and friends who tend to act as informal caregivers when needed. With 1 in 5 seniors requiring assistance with ADLs and IADLs, the need for qualified home care has never been greater. Many of the troubling statistics concerning informal and inadequate care can be avoided with proper planning and discussion with your elderly parents. Learn about the various types of home care services available, from part-time companionship to full-time nursing assistance, to help your parent age with dignity.